For a variety of reasons – some I can identify and probably some beneath my conscious awareness – my anxiety has been amped up this summer. Around a month or so ago, I realized the thing this summer that’s been absolutely calming my anxiety, every time, no matter what, is painting. 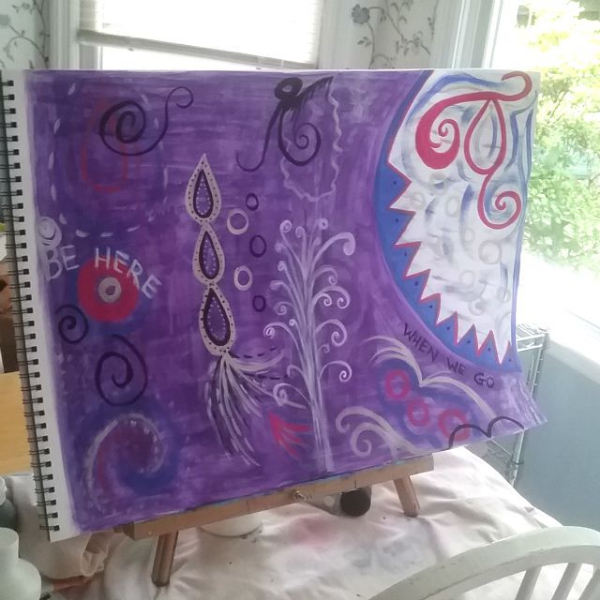 Playing with paint on the canvas. Or in the big spiral-bound pad. 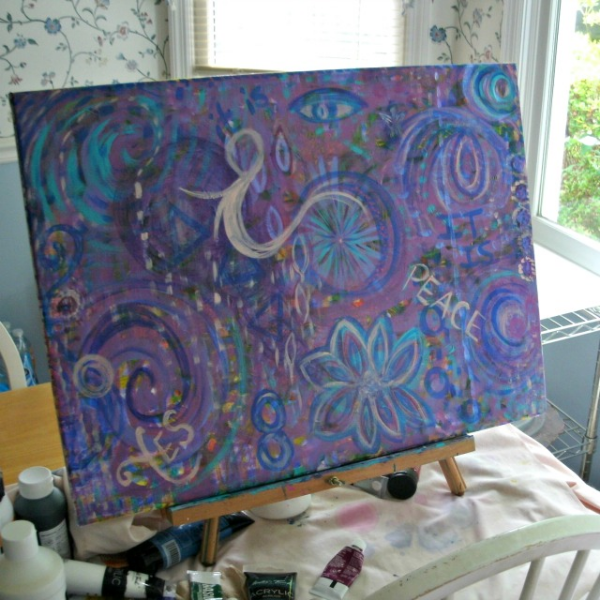 Moving the paint on the canvas or the paper as I stand at the table-top easel in my kitchen. I’m still using the other tools in my “toolkit” of anxiety-reduction techniques that help me. I’m being more conscious about returning to some of the tools that I’d been forgetting (or had let slide). I’m focusing a lot on my self-care. 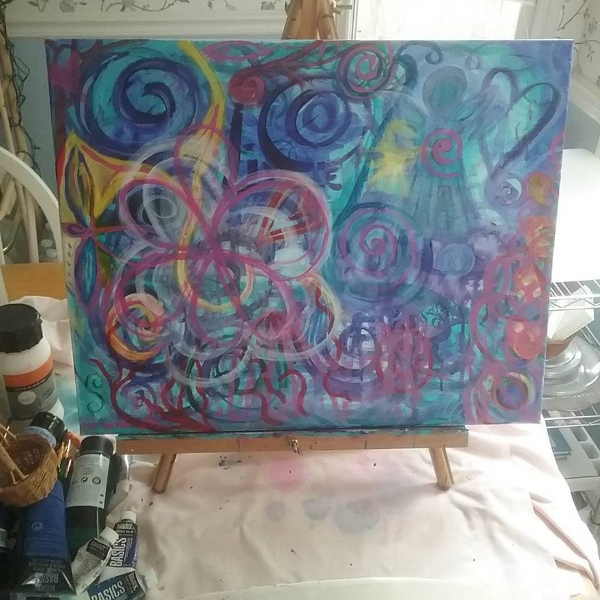 But the sure-fire way to still my inner trembling, to completely quiet my anxious thoughts and underlying feelings of anxiety – for me, this summer – it’s turned out to be painting. More than anything else. When I realized this was happening, I was sort of surprised. But I welcome the times of total freedom from the anxious feelings. I’ve known for quite a while that letting myself paint was soul-care for me. Painting whatever colors seem to be calling to me at the time, moving my hand or my brush in whatever way feels good at the time, not worrying about how it looks, not wondering whether I’ll show it to anyone, not being concerned what anyone will think if I do show what I’ve painted. 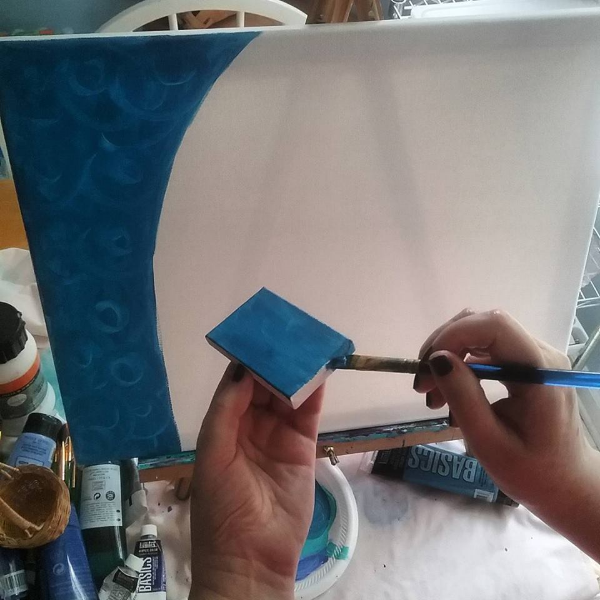 Just being with the paint and the painting. In the moment. In the flow. In the now. Losing myself and my anxiety in the calming of painting.